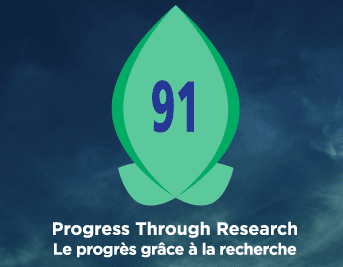 The goal of Plant Breeders’ Rights (PBR) is to encourage investment in plant breeding in Canada. Yet there is a misconception that PBR only benefits large companies. The fact is, large companies often have other tools to protect their intellectual property, including patents and contracts. PBR is critically important for public breeders, including universities, and smaller private breeders who may not have the resources or traits necessary to utilize other forms of protection. If a variety is protected under PBR, it is illegal to sell common seed, even if you don’t use the variety name. Under PBR, it is OK to keep seed on your farm – as long as the farm-saved rights are not pre-empted by another agreement or contract. Under the new PBR ’91 rules, the buyer, the processor and the seller are responsible for the infringement. Visit PBRfacts.ca for more information. April 1st marked the official launch of the Canadian Agricultural Partnership, a $3-billion commitment that will help chart the course for government investments in the sector over the next five years. The Partnership aims to continue to help the sector grow trade and advance innovation while maintaining and strengthening public confidence in the food system, and increase its diversity. Federal, provincial and territorial (FPT) governments have been working collaboratively since 2016 to develop the next agricultural policy framework, the Canadian Agricultural Partnership. Federal, provincial and territorial governments consulted with a wide range of stakeholders, including producers, processors, indigenous communities, women, youth, and small and emerging sectors to ensure the Partnership was focused on the issues that matter most to them. In addition, under the Partnership, business risk management (BRM) programs will continue to help producers manage significant risks that threaten the viability of their farm and are beyond their capacity to manage. The Partnership includes $1 billion for federal activities and programs, and $2 billion in cost-shared programs delivered by provinces and territories on a 60:40 basis. Program details and applications were launched for the six federal programs on February 13th and include: AgriMarketing, AgriCompetitiveness, AgriScience, AgriInnovate, AgriDiversity and AgriAssurance. The Government of Canada is working with provinces and territories to finalize the details of cost-shared programs, which will be announced as they become available. In addition to the $3 billion investment in strategic initiatives under the Canadian Agricultural Partnership, farmers will continue to have access to a robust suite of business risk management programs. Changes to business risk management programs are in effect for the 2018 program year. The sector is strong, with exports in 2017 of Canadian agriculture, agri-food, fish and seafood reaching $64.6 billion, a $2 billion increase from 2016 levels. Producers are also forecast to see record levels of net cash income, with increases in both crop receipts and livestock production. In agriculture, weather is the most important factor in determining the success of a cropping or grazing season. Alberta Agriculture and Forestry’s website features the Alberta Climate Information Service (ACIS) an interactive tool that helps producers, farm consultants, and researchers. ACIS is a network of more than 350 weather stations around the province reporting weather conditions in near, real-time. It includes detailed archival information that goes back to 1961. “With more than 350 weather stations to choose from, you should be able to find one close enough to you to be approximate to the conditions you are experiencing,” says Harry Brook, crop specialist at the Alberta Ag-Info Centre. Elements covered by this network include precipitation accumulated and recent, temperature extremes and average, relative humidity, wind speeds and directions, solar radiation, snow depth, soil temperature at four different depths, and soil moisture as a percentage of field capacity. These elements allow comparisons to long term averages. ACIS includes is a large amount of data on long-term averages for air temperatures, maximums and minimums, growing degree days at base 0 degrees, 2 degrees, and 5 degrees, and frost probabilities in 1 degree increments from 0 C to -5 C. The program also includes a wind chill index, and current weather radar can also be accessed. ACIS also features a large collection of maps that look at drought indexes, fire danger, precipitation, soil moisture and temperature. Detailed moisture information is found for Southern Alberta through the Irrigation Management Climate Information Network (IMCIN) to help with irrigation decisions. “There is also a Fusarium head blight risk map. 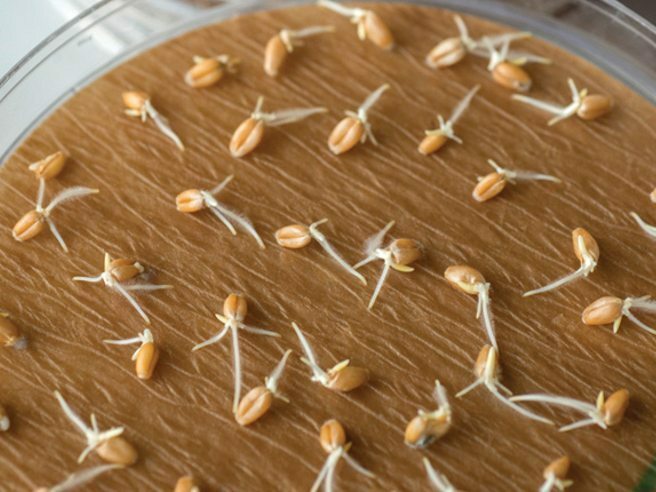 Using the preceding weather conditions, it can predict how likely it is that fusarium head blight will establish in your vicinity and help in timing for any fungicide application,” explains Brook. “Plans are also underway developing insect pest prediction maps for some of our most damaging insect pests. “Growing degree days, potato heat units, and corn heat units for localities are useful in estimating if various crops can be successfully grown. Also, these average numbers combined with frost probabilities are useful tools in estimating if there is enough time left in the growing season for a crop to mature,” he adds. Alberta Agriculture and Forestry is hosting a webinar on the many uses of ACIS on Wednesday, May 2, 2018 from 10 a.m. to 12 noon. Norm Lyster, centre, was presented the ASG's Honorary Life Award by ASG co-vice-president Renee DeWindt-Hoyme, and ASG president Ward Oatway. 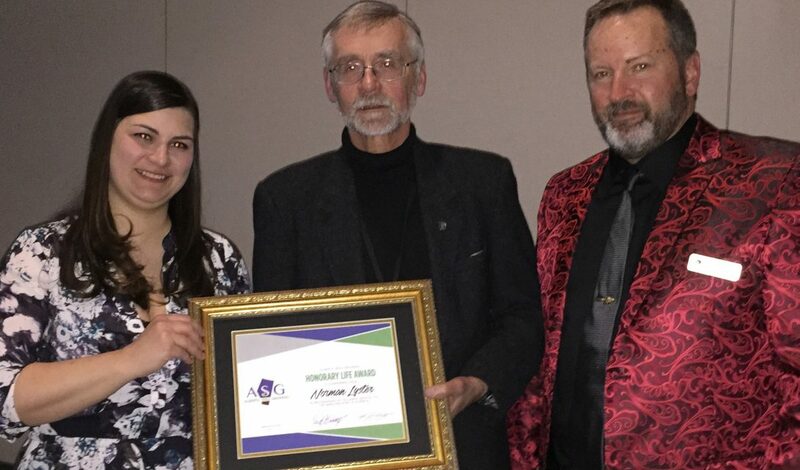 The Alberta Seed Growers honoured two individuals at their recent annual general meeting in Banff, Alta. 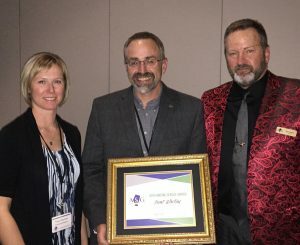 Norm Lyster was presented the Honorary Life Award in recognition of his valuable service to the seed industry in Alberta. 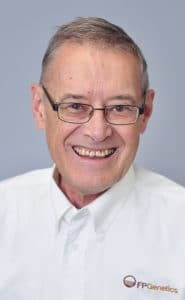 Lyster attended his first CSGA AGM in Banff as a seven-year-old in 1961 and has been involved with the Canadian Seed Growers in an official capacity since 1976. He earned a Bachelor of Science in Agriculture, majoring in agricultural economics, from the University of Alberta, where his thesis focused on market risk and the maturing risk reduction market for feed pea producers. He also obtained an MSc Ag. in 1999, majoring in marketing and trade, under a fellowship from the Winnipeg Commodity Exchange. Lyster has worked as owner, operator and manager of Lyster Farms Ltd. Integrated Pedigreed seed production, processing and sales since the 1980s. He is a CSGA recognized Select and Foundation Grower, and accredited grader and operator with the Canadian Seed Institute. Lyster’s involvement in the Alberta and Canadian Seed Growers has been long-running and multi-faceted. 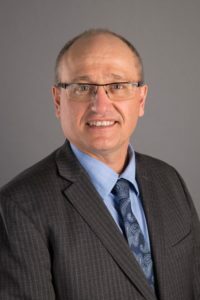 He was elected a provincial director of the Alberta branch of the CSGA in 1999 and served as national representative from 2003-2014. He was then elected president of the CSGA and served from 2014 to 2016 in that capacity. He is currently the past president of the organization. Trent Whiting, centre, was presented with the Bill Witbeck Outstanding Service Award by ASG co-vice-president Tracy Niemela and ASG president Ward Oatway. This year, Trent Whiting was presented with the Bill Witbeck Outstanding Service Award, for his outstanding contributions to pedigreed seed production. Whiting, Alberta/B.C. marketing representative with SeCan, has a degree in agriculture from the University of Alberta. For over 25 years, he has worked closely with seed growers in the seed industry. 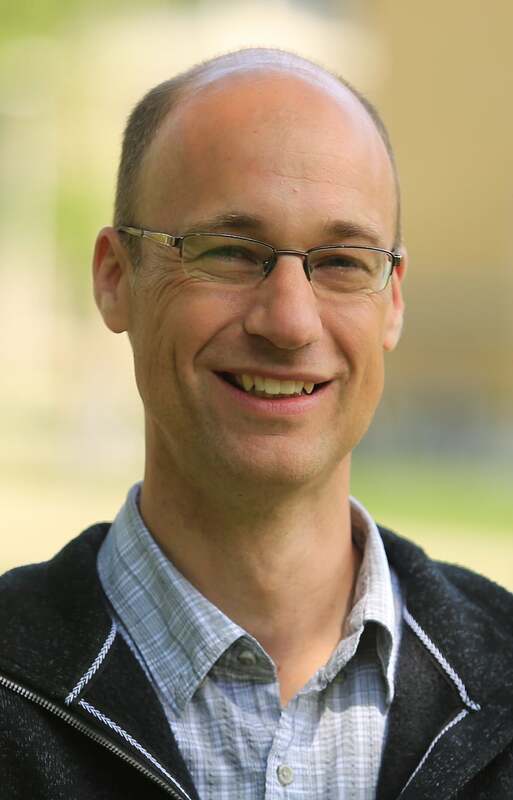 He started his seed career in Edmonton with UGG Forage and Special Crops in a production role. He remained with UGG/ Proven Seed until 2007, then a short time with BrettYoung before joining SeCan in the spring of 2008. 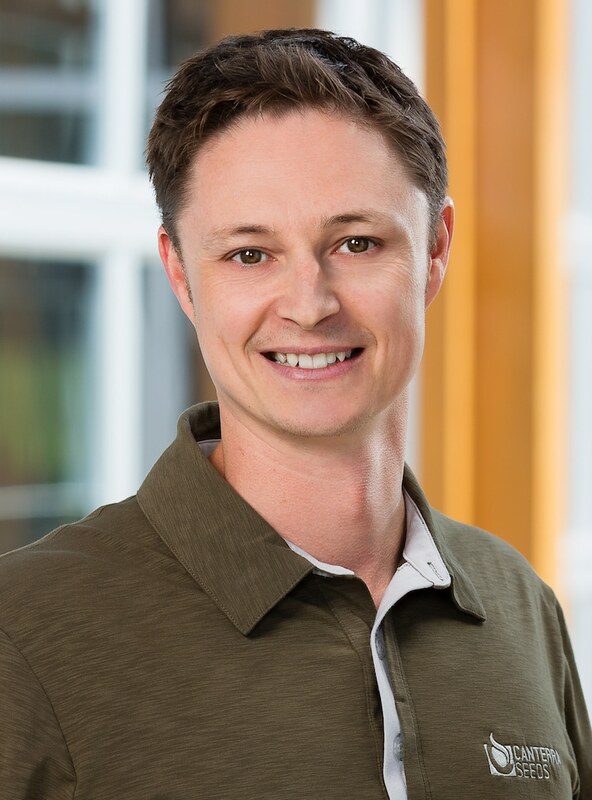 Whiting is a coach to his friends, his members at SeCan and his competitors in the industry – he has a drive to make all those around him better, and puts the needs of his members and their customers ahead of his own interests. In his role at SeCan, Whiting helps his members and their customers choose the best products for their farms – this may not always be a SeCan product and this is noted and appreciated by all. Recently, Whiting has taken on the added responsibility of stock seed production at SeCan in the west. Congratulations to Norm and Trent for their past and on-going contributions toward a strong seed industry in Alberta. The Ellis Seeds family. From left: Simon Ellis and his wife Amanda and son Lincoln; Megan, Karen, Andrea and Warren Ellis. Successfully navigating the pitfalls that are unique to family enterprises can reap great benefits for everyone involved. Ellis graduated from Assiniboine Community College in Brandon in 2013. It was at that point he assumed more responsibility at his family’s company. In 2015, Simon’s wife Amanda joined Ellis Seeds and is responsible for the financial and administrative side of the business. Recently, her father also came onboard, bringing with him many years of sales and management experience. This is the same belief that has endured for nearly a century when Ernest Ellis (Simon’s great-grandfather) started Ellis Seeds in 1923. At that time, Ernest shipped grass seed across the prairies because of the need to provide a quality product and produce productive land. Since then, Frank (Ernest’s son) took the reins, followed by his son, Warren, who is Simon’s father. “We take pride in that our product has flowed through all four generations,” says the younger Ellis. 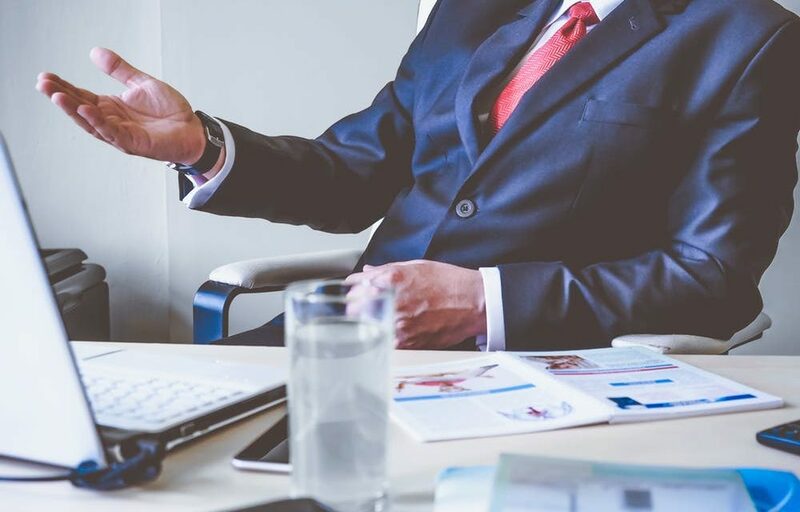 However, the journey has not been without its challenges, which is why he says communication is the most important thing you can do to navigate working in a family business. Richard and Marian Stamp and family, who operate Alberta’s Stamp Seeds. 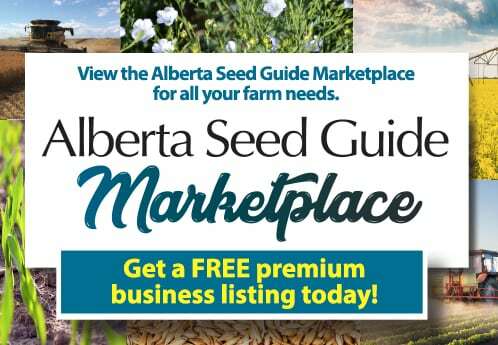 Rick Stamp is the owner and patriarch of Stamp Seeds, a family owned and operated pedigreed seed farm in Enchant, Alta., located approximately 77 km northeast of Lethbridge. It was back in 1979 that Stamp decided he wanted a career in farming. Prior to this, he had gone to college and became a steam engineer, but realized that wasn’t what he wanted. Since 1980, Stamp and his wife Marian have worked together as partners. Their three sons, Greg, Matthew and Nathan also work full time in the business, plus two of Marian’s first cousins, who have worked at Stamp Seeds for more than a decade. Stamp says his company has been successful largely due to deep-down compassion the family has for one another. 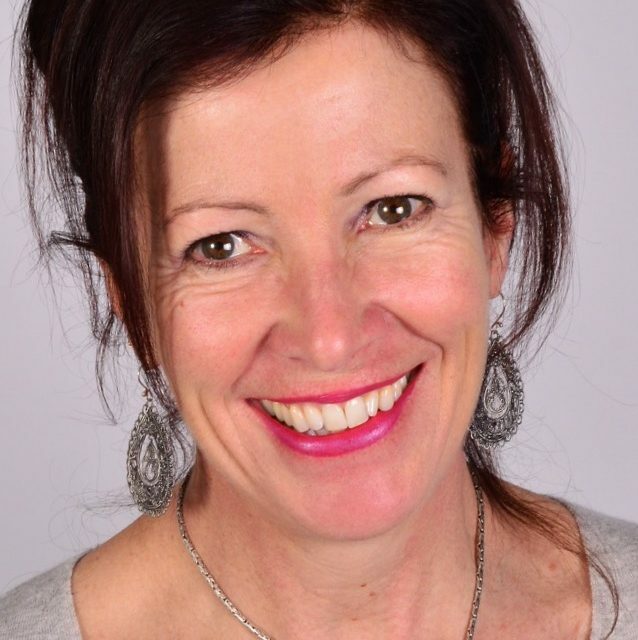 Francine Carlin, principal of the Business Harmonizer Group in Vancouver. 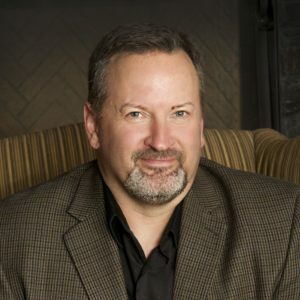 Carlin is dedicated to helping family-business owners and members develop meaningful solutions for resolving the issues and concerns that have become roadblocks to critical decision making. She has found that in her transition from corporate work to working with family enterprises, many issues can be much more complex in nature. For instance, in working with those in the agriculture industry, Carlin says many family farms are struggling. Carlin says what she enjoys most is helping to facilitate a shared understanding of complex issues by separating the person from the issue. Carlin adds that for those individuals who are considering starting a family business or joining a family business that has already been established, she offers this advice. 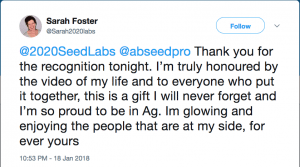 Sarah Foster, president of 20/20 Seed Labs, received the Outstanding Service Award from the Alberta Seed Processors at the 2018 AGM in Edmonton, Alta. on Jan. 18, 2018. 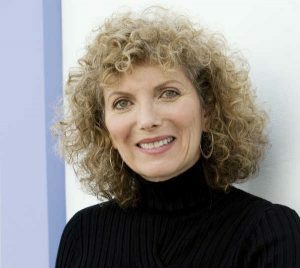 Sarah founded 20/20 Seed Labs in 1989. The laboratory is now fully accredited for all crop kinds in Canada and is the only private ISTA accredited laboratory in Canada. 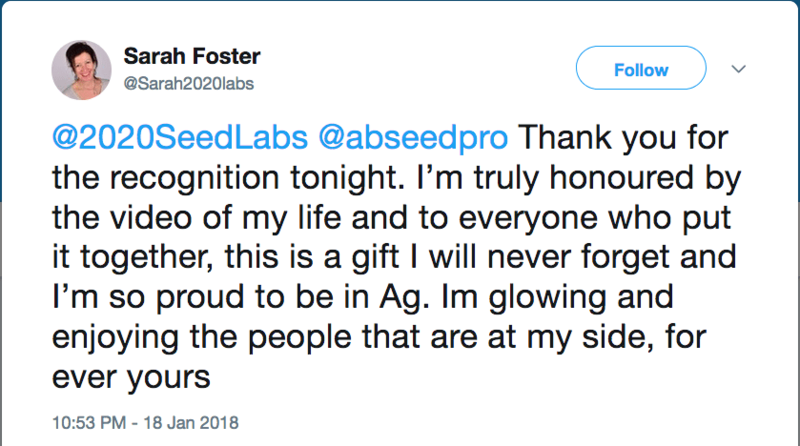 “This is a gift I will never forget and I’m so proud to be in ag,” Foster said on Twitter. 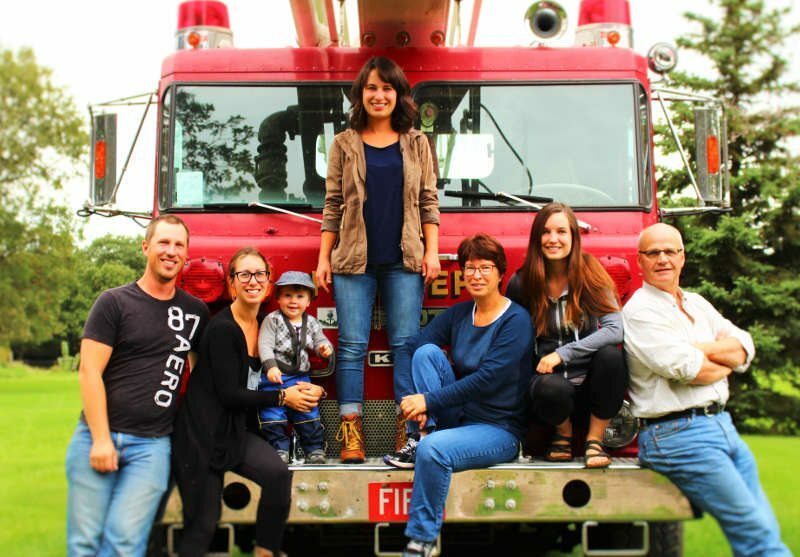 The Alberta Seed Processors created a video to highlight some of Sarah’s work. As you finish up your busy growing season, the last thing on your mind might be an industry board meeting. But as harvest comes to an end, farmers around Alberta are taking up the reins of boards across industries. Why sit on a board? For growers like Kevin Auch, it’s a matter of recognizing the potential in his sector and then working to see just how much progress can be made. The Alberta Wheat Commission was created around the same time the Canadian Wheat Board single desk was dismantled, as growers in the province voiced a desire to see some of the work of the board continue. Auch joined to become an active participant in the discussion of his industry, and is serving as chair for the remainder of his second three-year term. Auch farms 5,000 acres south of Vulcan. He is a strong advocate for strict crop rotations, as he says crop diversity is one of the biggest ways to manage disease and to keep agriculture sustainable. 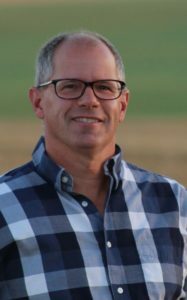 Currently at the end of his term as chairman of the Alberta Canola Producers Commission (ACPC), Greg Sears initially joined his board in 2012 as a way to stay involved in the industry and to share his expertise as both a farmer and an engineer. He says board involvement is an important way to help the agriculture community through service. The ACPC is made up of 12 regions and each region has a director. Usually it’s another member who encourages a colleague to participate, but Sears says he’d like to see even more farmers put their name forward for nomination. On his board, potential members need the signature of 10 eligible producers to become an official nominee. If there is more than one nominee in each region, elections are held within the region. 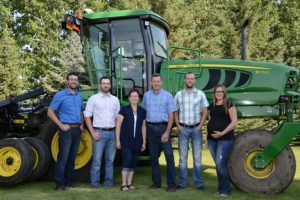 Sears farms 2,400 acres north of Grande Prairie and appreciates that board participation allows him to share his experiences and advocate for issues important to his region’s farmers. He says the ACPC board has directors who farm 1,000 acres, and those who farm 60,000 acres. He prefers to see both experienced and younger producers on a board in order to have a mix of voices, and to share different perspectives. 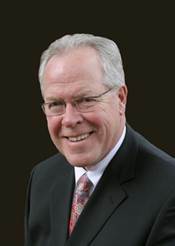 As the son of a seed grower, Ward Oatway grew up watching his father attend board meetings. In his youth, his summer family holiday was attending the national meetings. It was at one of those national meetings later in his career where Oatway was approached by the Alberta Seed Growers to join the board – and knowing what they had accomplished in the past helped entice him to put himself forward as a nominee. This is Oatway’s first year as the president of the Alberta Seed Growers and he says that while there has been a steep learning curve, having a supportive past president has helped him in his role. He says boards can also step in when the roles of different provincial and federal departments change suddenly. He points to when the Canadian Food Inspection Agency eliminated their crop inspectors. 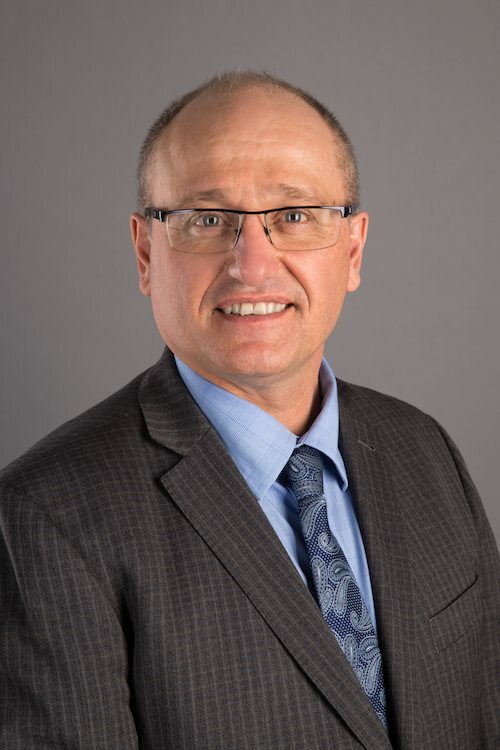 Several agricultural boards, including the Alberta Seed Growers, stepped up to make sure the new inspection process was in place so that the shift to third party inspectors went seamlessly. “What was a big change that could have caused panic instead transitioned easily in part because of the involvement of various boards,” says Oatway. “It seems like policy continues to change quickly, in terms of breeding and technology and global markets. We make sure our growers’ interests are being heard in those policy discussions. Oatway grows 1,300 acres of pedigreed pea, barley and wheat seed along with commercial canola on his farm near Clive. He says he wants to see more people volunteer to become members of boards. 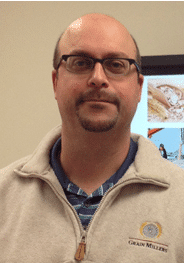 Growing oats for the milling market ideally shouldn’t be an afterthought, says Terry Tyson with Grain Millers Canada Corp. of Yorkton, Sask. 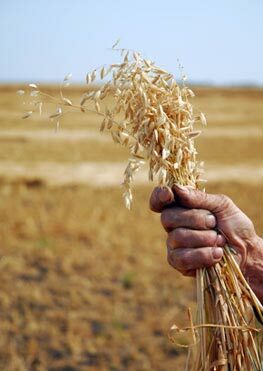 The requirements for a milling oat probably aren’t quite as rigid as they are for producing malt barley, but there are similarities. And it is a higher yielder as well, with field trials showing an average 114 per cent yield compared to CDC Dancer in Saskatchewan, and achieving 153 bushels per acre yields in Manitoba, according to the 2017 Manitoba Seed Guide. During the 2017 harvest, there were reports of 170-plus bu/ac yields. “Oats have been treated in two ways over the years,” says Tyson. “We have some growers who really pay attention to producing good quality oats and really treat it as a cash crop. And there are some producers who, depending on the year, may make it a last minute decision.